We love pets! That's why we've been hand crafting pet lover jewelry since 1991. 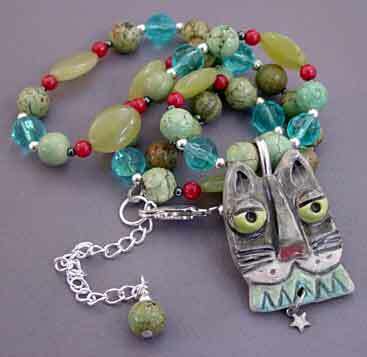 Though our name may contain that certain pet, we also offer handmade cat lover jewelry and gifts. Choose from cat themed necklaces, bracelets, and earrings in gold, silver, copper and brass. Each piece is made the old fashioned way, one by one, in our Missouri Ozarks studio. Rest assured, our cat, Skeeter, provides quality control! Support a small handmade artisan business and enjoy one of a kind, unique cat lover jewelry. Fast, free standard shipping, too! Visit For Love of a Dog for cat themed jewelry today! Join in and write your own page! It's easy to do. How? Simply click here to return to Cat Themed Gifts.